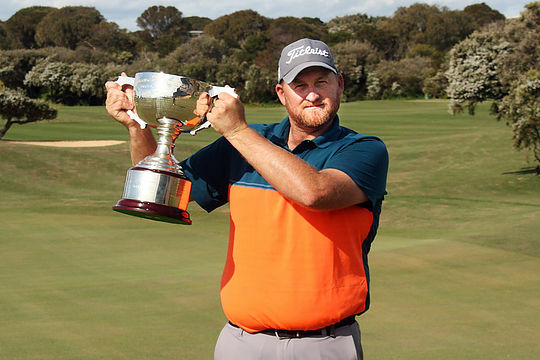 Aaron Pike has secured his first professional tournament winning the Victorian PGA Championship at RACV Cape Schanck Resort. Pike fired a closing round of 68 to finish at 10-under-par, after opening with rounds of 71-65-66, and a stroke ahead of fast finishing New Zealander, Ryan Chisnall who narrowly missed a birdie putt on the last hole to force a play-off. “My first win and it feels pretty darn good! It was a rollercoaster out there, as I was saying earlier in the week it was just going to be the guy who lasts the longest mentally out there and I feel as though I did really well at that,” said Pike. Pike will now have a guaranteed start alongside Marc Leishman at the Australian PGA Championship at Pines Resort from 29 November – 2 December as well as full exemption on the PGA Tour of Australasia until the end of the 2019 season. The victory also sees Pike with entry into four co-sanctioned tournaments with the European Tour and Asian Tour. For his win Pike, 33, receives $15,000 in prizemoney and moves to 41st on the Tour of Australasia Order of Merit. Pike’s previous best result was a runner-up finish to Stephen Dartnall at the 2016 Western Australian PGA Championship, yet many recall his efforts during the 2006 MasterCard Masters where he lead the field following an opening round of 64 to eventually finish in 4th position, three behind winner, England’s Justin Rose. During the last three years Pike has played solely on the Australasian Tour with mixed success. During 2017 he only played two events whilst in 2016 he played 18 events making the money in 12. Following Sunday’s win he moves to 811st in the world rankings have reached a career high of 562nd in 2006. New Zealander Harry Bateman was third on 8-under. Stephen Leaney, Matt Millar, Frazer Droop and Rick Kulacz all finished at 7-under the card in a tie for fourth.